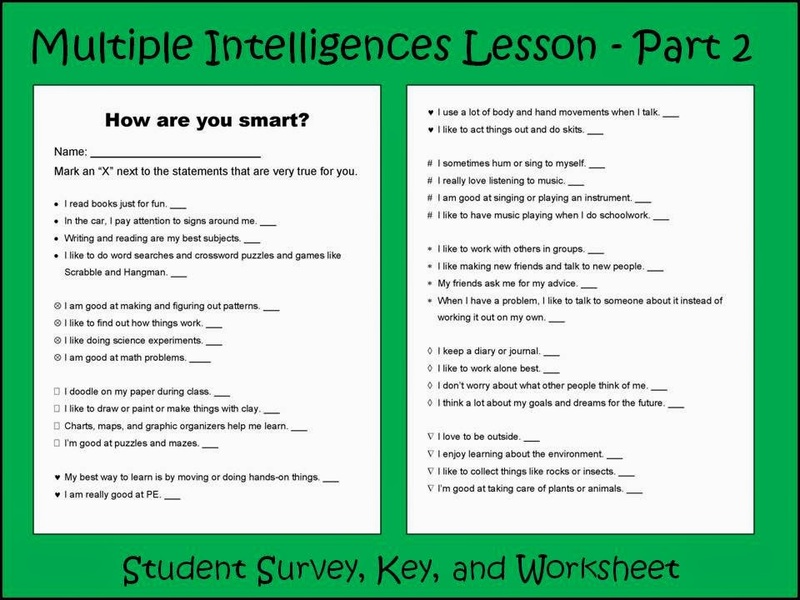 Part 2 of the Multiple Intelligences lesson is here! See Part 1 here. 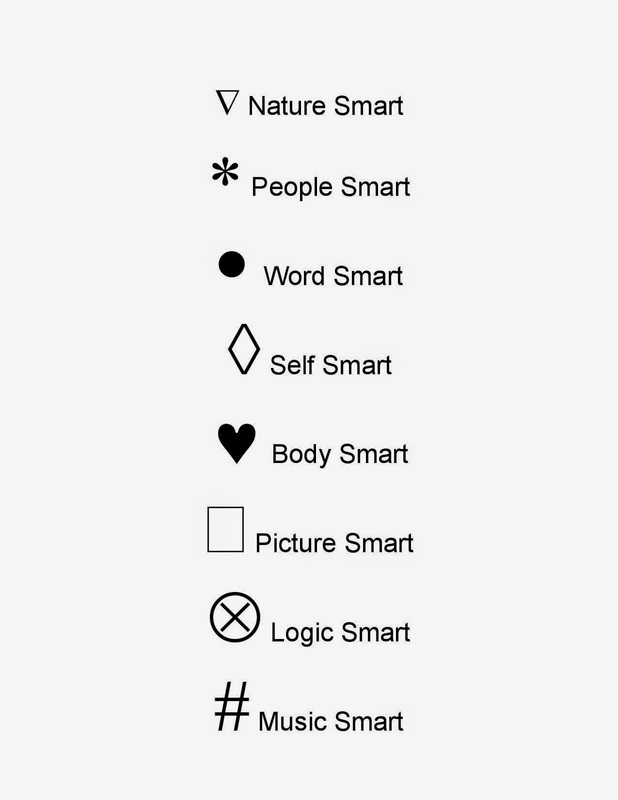 -Review the 8 kinds of “smarts”. First asking students to list which ones they remember, then read the descriptions below and ask them to identify which smart they go with. o Enjoys solving difficult word problems, likes to work with numbers, likes to organize facts and information. o Enjoys reading for fun, likes to write stories or letters. o Can read maps and diagrams easily, likes to draw or paint. o Likes to care for the earth and nature, likes to be outside. o Likes to listen to music, good at singing or playing an instrument. o Likes to be alone, needs time to think over ideas, thinks about their own feelings. o Enjoys sports, dancing, or using their body to learn. o Gets along well with others, friendly and helpful, likes to meet new people. 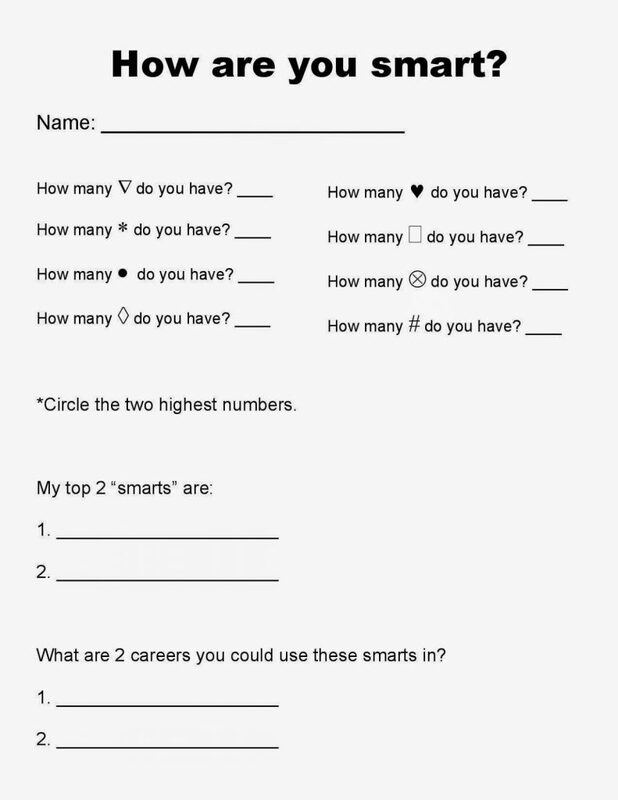 -Give each student a copy of the smarts survey and explain how to take it. 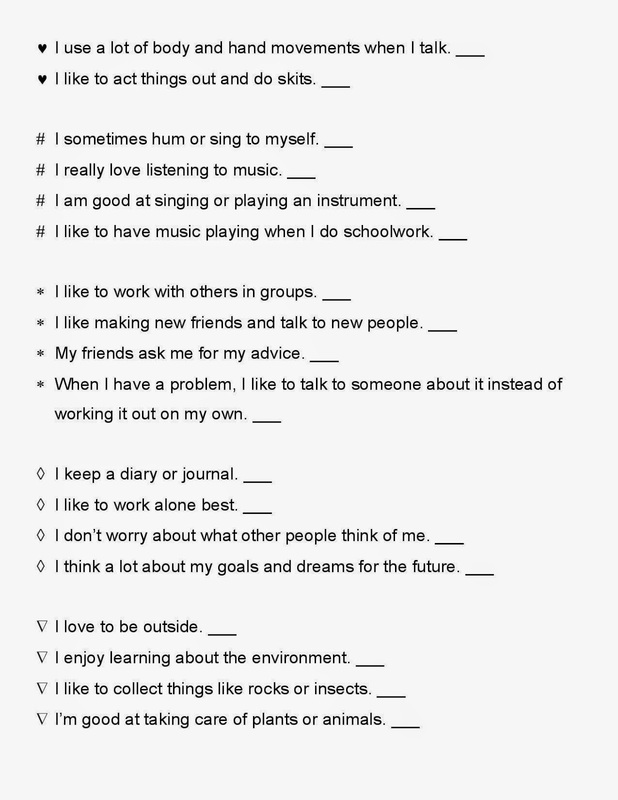 A note about the survey: I needed something that was black and white, super simple and fast to administer, and appropriate for below-grade level 4th graders. 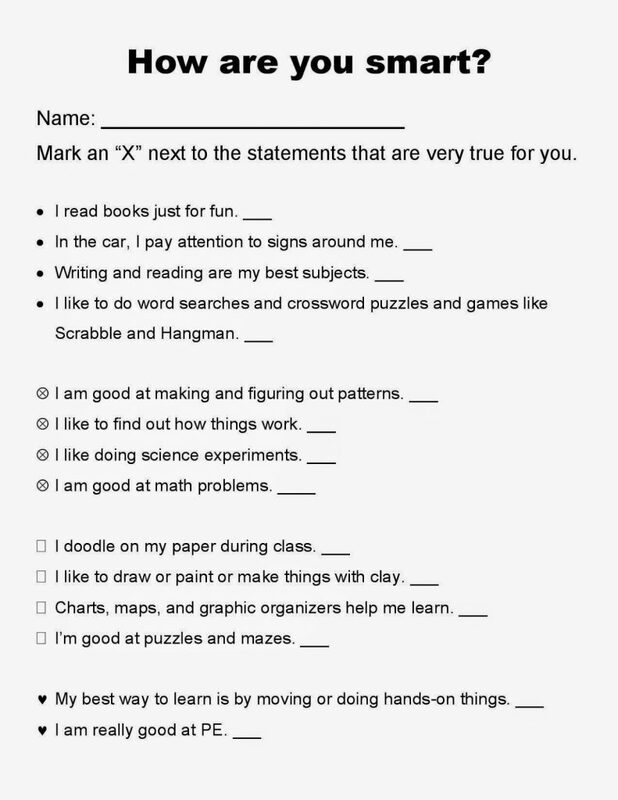 Nothing I found was perfect, so I used http://www.teacherspayteachers.com/Product/Multiple-Intelligences-Inventory-for-Kids-314679 and http://www.teacherspayteachers.com/Product/Multiple-Intelligences-Survey-Unit-322865 to create my own. Link at the bottom if you want to download/edit. 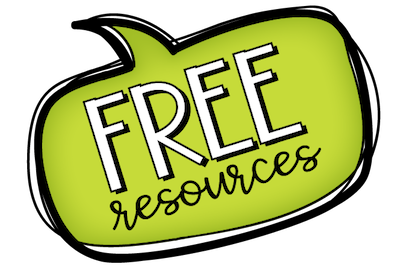 -Hand out the processing/scoring worksheet, show students the scoring key, and ask them to fill it out. 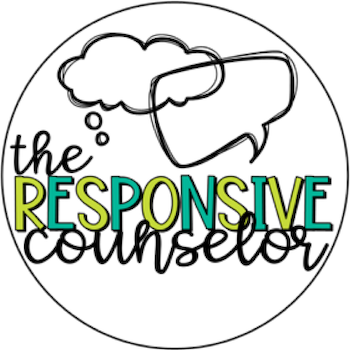 It took a lot of creativity (from myself included) to think of careers that used some of these combinations, but that made it all the more interesting. *Some students were upset when they didn’t score as “Body Smart”. I had to do lots of explaining about how just because we love doing something and think we’re good at it doesn’t necessarily mean that’s our “top” smart. *I had originally planned on having the kiddos all sign their name on a poster representing their top smart. Unfortunately, we ran out of time. This could have been a neat way of them gaining even more ownership of their “smart”. 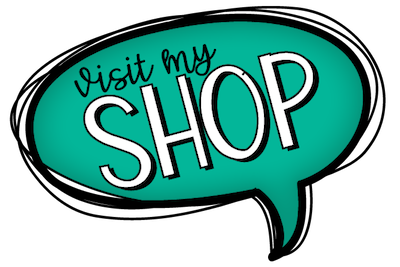 Want to use this as is or edit it for yourself? Here it is!